Free Homeschool Lapbooks: Pick one of five history lapbooks for free! Peace Creek on the Prairie has a great list of homeschool deals and freebies up right now. One of her awesome offers is the opportunity to pick one of the five history lapbooks shown in the picture above for free! 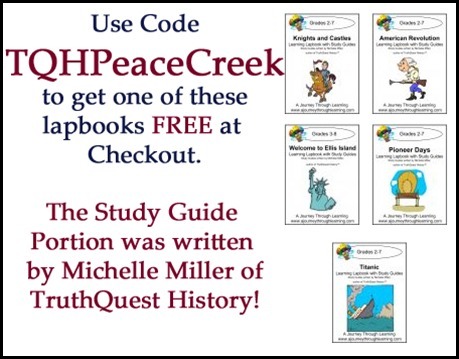 The coupon code, link, and directions to choose which free history lapbook you’d like and download for free is located in the homeschool deals and freebies post on Peace Creek on the Prairie. Ok I tried to get this deal using the directions on the Peace Creek site…it did not work. Help? Candice, I’m not the one issuing this freebie. It sounded good, and like it may work out well, so I’m just pointing you to it. I wish is was easier to get, but from what I’m hearing there seem to be some issues. I have no control over getting you the lapbook. Shoot the site offering it an email and they should be able to help you. I ordered the Titanic lapbook as the free lapbook i chose and used the promotional code indicated and now am told that I will receive the program once you receive my payment. Can this be corrected? I ordered my lapbook last night following Peace Creek’s directions (make sure you read them carefully!) and then received an email with a link to download today. I would just ignore the message that says you will receive it when payment is made unless it’s been over 24 hours.